If you’ve thought to yourself, “Man, I really wish I had a brand new reason to love Tom Holland today,” you’re in luck. Holland, who you probably know best as Spider-Man, recently rescued a stray dog…and stole our hearts. Holland saw the doggo wandering all alone, and so he did what any young hero would: He asked his thousands of Instagram followers if anyone recognized the pup, and then took the dog to the vet for a checkup. The entire episode unfolded on Holland’s Instagram Stories. In the first slide, he was dancing along to “Locked Out Of Heaven” by Bruno Mars, as one does on a nice day. But things soon took a turn when he realized he was being followed by the stray. Holland — a known dog person — took action (he also called the lttle guy Bruno, which we’re assuming was an homage to Mr. Mars). Here’s Holland walking Bruno, who looks like a very good boy. And because Holland took Bruno to the vet, he was able to discover that the dog was, in fact, microchipped. The vet said that Bruno’s owner would be contacted immediately, and he’d get to go home asap. 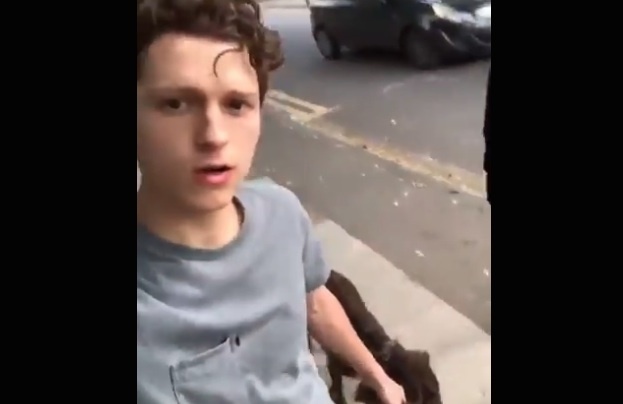 We don’t know what we love more: The fact that Tom Holland is so freaking nice that he actually took time out of his life to ensure the safety of a lost pup, or that Bruno’s owners will get him back and have literally no idea that Spider-Man saved their dog. Sometimes real life truly is stranger than fiction…in the best way possible.